Those perusing texts written by personnel accompanying the Portuguese navigators and administrators after the 15th century may have come across mentions of a sacred stone connected to the Cochin king’s or varyingly, the Zamorin’s coronation. Some of the legends connected with it make interesting reading and so I thought it a good idea to cover it. A pointer to its origin and potential connection to Chinese trade at Calicut comes from the accounts of Garcia D Orta. Garcia da Orta, was the first Physician to the Portuguese Viceroy of India at Goa and wrote his treatise (Coloquios dos simples e drogas e cusas medicinas da India) on Malabar medicine in 1563 and was a contemporary to Sheik Zainuddin. Once a physician to the King of Portugal, Garcia de Orta travelled to India in order to escape the Inquisition and remained in Goa for the rest of his life. De Orta survived the Goan Inquisition, but after his death in 1568, his Jewish ancestry was discovered, and his body was exhumed and burned in an auto-da-fé in 1580 (This interesting personal detail is provided only because he failed to mention the Jews of Cochin in his lucid Cochin account). In his reply to Ruano, he states these about the Chinese at Calicut, and the Chinese stone. 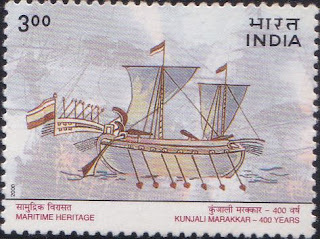 It is very important for readers of Malabar history, for its testifies to Chinese trade at Calicut prior to the arrival of the Portuguese, the China Kotta at Calicut, and the stone left at Cochin. Let’s read Orta’s account - I know the number of Chinese ships that navigates having counted those which went to Omruz as recorded in their books and there were 400 junks which entered the port of the island Jeru, now called Omruz. They also say that 200 junks have been lost on the rocks of Chilam. Junks are long vessels which have their bows and sterns alike. In Calicut they have a fortified factory, which still exists, and is called the China kota or the fort of the Chinese. In Cochin they left a stone as a mark in memory of their having been there, When the king of Calicut (called Zamorin or the emperor) besieged Cochin because the Portuguese held it who were then engaged in the discovery of India, he destroyed the place and carried off this stone as a trophy, which cost him very dear. On this stone the king of Repelim (Edapally) was crowned, the zamorin placing the crown on his head, who received homage from him, and the stone was left at Repelim by the order of the Zamorin. Repelim is four leagues from Cochin and there the stone remained until 1536. Then Martin Affonso de Souza the not less invincible than fortunate captain, burnt sacked and destroyed Repelim. The king fled and many with him and many of those were slain who did not escape as I can testify, being an eye witness, the stone was taken back to Cochin and the king ordered great festivities to be made over it and thanks to be given to those who brought it. He remained deeply obliged to Captain Martin A De Souza, who twice drove the king of Calicut out of his territory and sent him the sombreiro, which he took with the praus in Beadalla (there were 57) where 15000 men were killed, remaining with him no more than 300. He also took 600 pieces of artillery and more than 1000 muskets. As the deeds of this great captain are many, I will not tell you more. These that I have mentioned are not told in praise, for he has acquired more praise than anyone else of his time, but I tell you of them to make clear what I said about the Chinese. KS Mathew provides his brief - The Chinese in the long past had left a sacred stone in Cochin where the chief rulers of Malabar were supposed to be crowned with the help of a Brahmin. This stone was removed from Cochin in course of time and was installed at Edappilly. As was the norm, the new Zamorin of Calicut decided to have his coronation in the hands of a Brahmin from Cochin at the place where the stone (seat) was left. He therefore associated himself with the ruler of Edappally and came with all his forces. The King of Cochin too was duly informed. Rama Pisharodi in his study of the Malayalam calendar adds some more conflicting information tilted towards the Perumpadappu, as follows – The all-Kerala Overlordship that is here maintained for the Cochin Royal Family is based also on some positive evidence available from the Portuguese records. These generally refer to him as the ‘King of Cochin but sometimes as the ‘Emperor of Kerala’. It is stated therein that ‘the Kings of Cochin are considered to be the spiritual head of all the Kings in Malabar ‘that ‘they had in former days some sort of supremacy over all the Kings of Malabar and further that ‘all the Kings of Malabar had to get their investiture from the King of Cochin. In support of this last statement, there is also recorded as interesting practice about the Zamorin’s coronation, which definitely shows him to be a feudal vassal of the ‘King of Cochin’. The Zamorin’s coronation, according to these records, was to be conducted at the court, and by the King of Cochin. The heir to the masnad had to go to the latter, give up his kingdom and make it over to the King of Cochin and then take it back from him after his coronation. During the ceremony he was to be seated on a marble slab on which was to be engraved the name of the Zamorin and the date of his coronation. In later days, the ceremony used to be conducted at Palliyarakkavu near Chirakkal Palace in Ramesvaram village at Cochin. Chafing at this continued exhibition in public, of his vassalage to the King of Cochin, the Zamorin got the marble stone removed to the Raja of Idapilly (Reppelin of the Portuguese) where he used to conduct it subsequently. In the thirties of the 16th century there was a Zamorin’s coronation. As usual the heir-apparent came down to Idapilly, but he was opposed by the Portuguese, defeated and forced to retire. The latter were also able to seize the sacred marble which was handed over to the King of Cochin who deposited it in the pagoda (This incident is described as taking place in December 1536 A.D. It is not clear from the records which the Pagoda was where the stone was deposited. It may possibly be the Palliyarakkavu temple itself). Thereafter the Zamorin put a stop to the practice of getting crowned elsewhere; but built a temple near his own palace and used to be crowned there. There is an interesting record and it clearly attests the feudal nature of the Zamorin’s kingship and the overlordship of the Perumpatappe Muppil. When the Zamorin, the most powerful of all the Kerala Chiefs, was himself the vassal of the King of Cochin and was forced to acclaim him as his overlord, the vassalage of the other kings need not be dwelt upon, for every other Malayali chief was the vassal of either the King of Cochin or the Zamorin even during historic times. PKS Raja opines thus in his Medieval Kerala – After attending the annual assembly held in Cranganore in 1536, the Zamorin resolved to perform the traditional ceremonies on the sacred stone. This stone had been removed from Cochin to Idapalli by his predecessor when he had attacked the Raja of Cochin in 1503. The Raja who wanted to prevent this at all costs requested the assistance of the Portuguese. This resulted in a general war between Cochin and Calicut. Assisted by the Portuguese the Raja was able to bring back the stone and place it in his own territory. The Portuguese were also benefited by this war as it enabled them to erect a fort at Cranganore. As a result of this war the treaty between the Zamorin and the Portuguese came into effect only in January 1540. According to Correa, the stone was a fathom (7’, 2 ½” inches) tall, thick as a man, and set upright on a stone base. The inscription said that it had been erected 2,800 years before (which seems incorrect for these was no Cochin, no Zamorins or recorded Chinese trade). The names of the Zamorins who had been crowned were chiseled upon it. The Chinese had come to India with a thousand junks full of wares 480 years earlier. These people lived and died there, when Chinese came again to India, they found their descendants. Miranda records that Souza carried off the Zamorin’s ceremonial umbrella, the ancient coronation stone and his costly Chinese metal plate. The metal plate had Chinese characters and snakes engraved on it and the king of Repelim held it in high honor since it pertained to his religion. Castanheda’s account elaborates on the future of the stone - The Samuri, however, having succeeded in this one matter, determined on another which brought him into contact with Cochin itself. He determined to perform those ceremonies at the sacred stone which his predecessor had removed in 1503 from Cochin to Eddapalli, which would enable him to claim lordship over the Southern Malabar States. 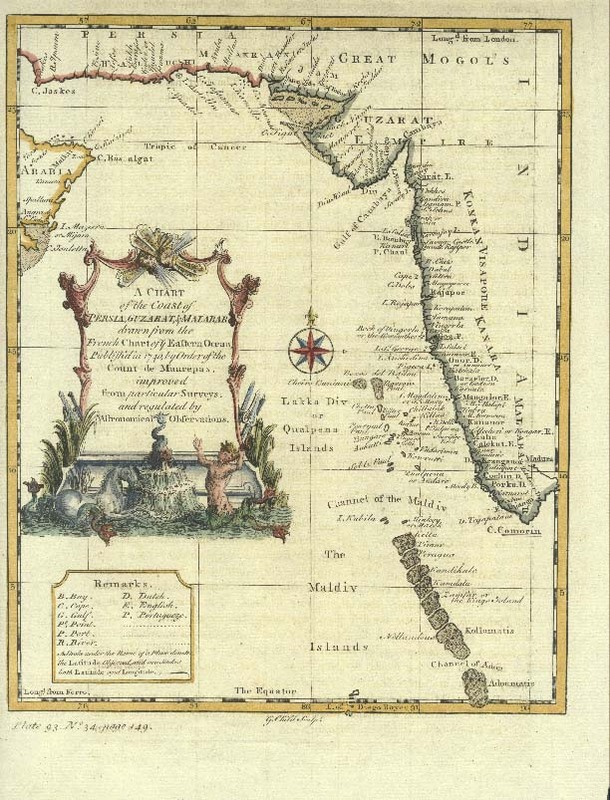 As the Raja of Cochin was particularly desirous that this should be prevented, the Portuguese, though their hands were full elsewhere, sent a force to his assistance. The stone was brought back from Eddapalli to its old resting-place in Cochin; but, unfortunately for the future peace of the country, the small payments made to certain Malabar chiefs were stopped by the Portuguese, this detached them from the party of the Cochin Raja and was some years later productive of trouble. Picking up Castanheda’s accounts of 1536 - Affairs in Cochin went on badly. The people were opposed to their Raja's policy, but he, with rare good faith, refused to abandon the Portuguese; he refused also to allow them to retire to Cananor, or even to allow them to venture themselves in the fight. On March 31st and April 3rd, the Samuri was defeated by the troops of the Raja of Cochin, but in a later battle at the Eddapalli ford the latter was defeated, and three of his nephews, including the heir apparent, Narain, were killed. Public feeling ran higher than ever against the Portuguese, but in his retreat to the Island of Vaipeen, a sanctuary the Samuri dared not violate, he took them with him. The Cochin territory was overrun, and the sacred stone at which the Samuri was made the Lord of the Southern Malabar States, was removed from Cochin to Eddapalli. Castanheda describes the stone itself differently, in his account, it is no longer a slab, a stone or a marble stele. He states it was white like any other, the shape and size of half a millstone of a water mill and inscribed with some Malabar letters. But we know that the stele of Cochin was in Chinese, perhaps it had both Chinese and Tamil inscriptions. Godinho’s accounts and Rev Hosten’s summary of those has an even more interesting theory – He surmises – New to me is the connection established between the sacred stone of the kings of Cochin and the Emperor of China. Other Portuguese historians Couto in particular I think connect that stone with the great Cheraman Perumal and state that there were wars between Cochin and Calicut for its possession. We cannot leave Barros out – He commented thus in Decadas - “The Chis (Cheras?) , who were formerly lords of all the Malabar coast, reduced the whole land into two provinces under two heads, one with all the temporal power with the title of Samoodri and the other with all the spiritual jurisdiction with the title of “Chief Brarmne”, whose headquarter the Chis located in Cochin, having it for an established custom that all the emperors of Malabar should go and procure the investiture of the empire from the bands of the Chief Bramane of Cochin, and for this was placed in that town of Cochin a stone with the obligation that the emperors should be crowned on it. This ceremony was in use for many years when the king of Calicut ... destroyed the land of Cochin on account of the friendship it enjoyed from the Portuguese, look away the stone and placed it in Repelim''. Barbosa does not seem to have spent any time on this subject, unless I am mistaken. I must also mention that KV Krishna Ayyar does mention briefly the stone and the Barros account in his two books, turning the entire story on its head with the following comment. He (Zamorin) caused the coronation stone seated on which the Cochin rajas had been invested as Gangadhara Koviladhikarikal to be removed to Edapalli. This is clarification that the stone was earlier used by the Cochin raja for his coronation and had nothing to do with the Zamorin. That brings us to the history of the Perumabadappu Swaroopam and its move from Chitrakoodam in the Ponnani area of Malabar to Cochin, which is long and convoluted (and one which I will cover separately), so to simplify, the Cochin rulers owe their overlordship of Cochin to the erstwhile rulers of Edapally or the Elangallor swaroopam. Sanjay Subrahmanyam and K Mcpherson in their book also imply that the stone was one upon which the Perumpadappu rulers were crowned. In all probabilities, it was the Chinese stone gifted to the Cochin ruler of Edapally or Cranganore, which was taken by the Perumbadappu rulers of Cochin when the state was bestowed to them and this was seized and gifted back to Edappaly by the Zamorin, so they can claim their lands back. The names prescribed may have been the names of erstwhile Perumbadappu, Edapally or Cranganore swaroopam rulers, not the Zamorins of Calicut. But it is quite murky and needs additional research, which may prove to be difficult unless the stone or its facsimile is discovered. Finally, according to Chinese sources, the stele left behind at Cochin by Zheng He in 1412 (or 1417?) had the following poem engraved on it and it was implanted near a hill named Zhenguo zhi Shan (mountain protecting the nations). The poem also contains a hymn composed by the Chinese emperor Chengzu and reads thus (translated by Tan Chung in Himalaya Calling). If it were near a hill then it was on the slopes of the Western Ghats. O southern mountain lofty, pacify the seaside country, clouds from your mouth bless the place beneath, eliminate the troubles, while elements in harmony, drive away evil spirits, bumper harvest pretty, your people in auspices, forever safe and calamity free, happy all year long leisurely, entire family hearty and healthy, Oh! Great be the mountain, and deep, the sea! There are a number of new avenues opened up in this short summary which could be explored further, we can see that the Chinese stone was very important to both the Cochin Raja and the Zamorin, we observe that wars were potentially fought over it, we note an eyewitness mention of the China Kotta at Calicut (not Chinna kotta or small fort as some historians believe) we see that the stone was a gift from the Chinese with Chinese and Tamil characters, the Tamil ones relating to a list of certain rulers (Calicut or Cochin) in power. We can also conclude that it was last deposited at the Palliyarakkavu temple in Edapalli, but may have been taken back to Cochin, never to be heard of again. Interesting article as usual sir. Edapilly raja(elamballur swaroopam) were one among few nabootiri rulers of kerala, ruling naboothri were called nambitiathri. Infact the whole of kochi town, varapuzha, edapilly, kalamssery, thrikkara all belonged to them. Their origin trace back to nabootri clan who were doing poojas in famous thrikkakara kovil. Later they ruled temple and adjoing areas. usual two nabootri kovilakam to get involved marriages among members. One raja of edapilly gave his son,who was to crown as next kochi prince, all land, comprising kochi town,and varapuzha.This created division in edapilly kovilakam and resulted in longest family feud in the history of kerala. Samoothiri who has got low pedigree than kochi ,but having more wealth accumulated through trade, played as saviour of edapilly.All the war sammotiri fought with kochi was aided and abetted by edapilly.The edapilly nambithari himself led the forces of samoothri many a times. The asylum given to portugese changed equation.Edapilly had to bear the brunt of portugese attack. The stone u mentioned,underlies clearly chinese connection,like chinese fishing net in kochi back waters. Incidentally this stone also become bone of contention between kochi and edapilly and samootri got entangled in between. Thank you sir. Let me also mention few facts .My family puthalathu also connected with edapilly kovilakam, as my great ancestor kelu nair from calicut puthalthu, came via kalladikode which was under edapilly kovilakam. It was belived to be happened 1805 AD vast area of land given to my ancestor. Again this kovilakam donated land to nicholas vaidyan who cured eye disease of one of the palace member. Unlike nair swaroopams ellamballur swaroopam never have expanstionst Tendencies,it was confined to mostly temple Administration . Most of the kula daivaom(family god) of nairs of aluva, perumbavoor etc is ganapathy kovil under ellamballur swaroopam at edapilly palace. It is wonder for me,cheranallur karthakanmar ( fighters for kochi kings)which is 2 km from edapilly never fought for edapilly, as the kings of edapaly never encouraged annexation of other territories . When british decided to merge edapilly with kochi in 1825, edapilly raja protested. So britis merged it with travacore,hence most of the nairs under edapilly kovilakam got sir name pillai which was given to travacore military. Great poets edapilly ragavan pillai,and chagapuzha krisha pillai all hails from edapilly. for adding information about Edapally..